Situated on a practically private sandy beach on the Mirabello Bay at Agios Nikolaos, northeastern Crete, the recently renovated Coral Hotel is a holiday oasis only five minutes away from the bustling town-centre. 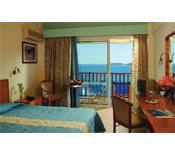 The hotel’s 165 spacious guestrooms are equipped with modern amenities including A/C, Satellite TV, bath or shower, hairdryer, telephone, radio music, refrigerator and balcony with sea view (most of them) of the Mirabello Bay. 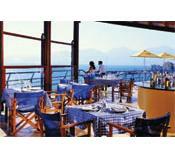 The main restaurant features rich breakfast and dinner buffet dining with breathtaking sea views. There is an extraordinary rooftop swimming pool, a sun terrace and a pool-side snack bar for unforgettable hours of relaxation. Cocktails can be enjoyed with soft background music at the lounge bar on the ground floor. There is a 24-hour reception service and a convenience store for quick and easy shopping. There is a diving centre on the waterfront and next to it an array of water-sport facilities, including Jet skiing, parasailing, rings, water-skiing etc. 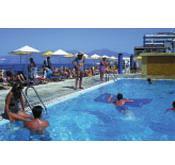 Special events such as Cretan and Greek nights are organized in the hotel-bar area. 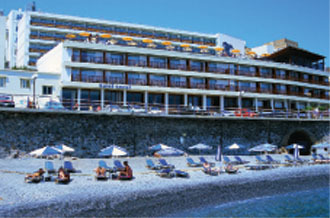 In front of the hotel, a new shingle beach has been created to provide hotel guests with the unique experience of bathing in the BLUE FLAG awarded crystal clear waters.